I feel an affinity with many carvers of the 20th century; Jacob Epstein, Ernst Ludwig Kirchner, Hermann Scherer, Ossip Zadkine and countless anonymous tribal artists from West Africa, as well as Weit Stoss, the 15th century carver of altarpieces. Amongst painters, Masaccio and the 15th century Flemish painters Rogier van der Weyden and Hans Memling, but my all time favourite painter has to be Max Beckmann. How did you come about the idea of creating Amazons from carved wood? I've been carving mostly female figures for the last 35 years. Looking back I think that most of these figures could be described as Amazons. The Amazons were warrior women described by Herodotus in the 5th century. They were thought to be mythological, but recent excavations in Ukraine (which is the historical area where Herodotus described them living) have unearthed the graves of women buried with their spears and horses, and it's not difficult for women today to imagine warrior women existed. We can identify with them. We know women can be tough and strong. To carve women is also a deliberate decision I made as a result of studying the history of art which until recently was the story of women seen through the eyes of male artists. I wanted to show what it felt like to be a female artist making images of females, so a lot of the sculptures are based on my own experiences. Sometimes they parody the stereotype of those other images made by men of draped 'nudes'. I love playing around with those images, they are endless in their permutations and meanings. But none are definitive statements. I'm not saying women are like this or that. Each sculpture is an idea. We can more or less choose to be whatever we like now (at least in the west). The Amazons in this exhibition may be tough and strong but they are pulled in other directions as a result of their biology. They menstruate, bear children, and can be vulnerable under these pressures, so in the Amazons I'm exploring ideas about gender, patriarchy, role assignment, the place of women in society, violence, war and who wages war. It's interesting for me to look back and see how my art has developed. I gave my first solo exhibition the title 'Strong Women'. I had exuberant pieces in it with titles like 'It's Great to be a Woman'. This was followed by 'Bad Women' with rather more sober studies of women who were often misogynistically represented in history, such as Sirens or temptresses. I have tried to explore many female stereotypes in my Witches exhibitions and my Corporeal Insults exhibition where women are vulnerable victims (never a popular view!) who suffer and are damaged but survive. My recent work is extending this interest in human behavior to our attitudes to outsiders, non-human life forms, and to our environment, alongside a continuation of my interest in evolution which has convincing explanations for many of our behaviors if we can accept that we are animals. Why did you choose to convey your message through wood as opposed to another medium? I was born in Nigeria and spent my formative years there and in Ghana. (My father was a refugee who fled Poland in 1940. He was a soil scientist and he and my mother who was of Welsh origins lived in West Africa until my mother's death there in 1973). I was brought up surrounded by woodcarvings made by tribal carvers. My mother loved and appreciated these carvings and passed this admiration on to us. But it wasn't until years later in my late 20's when I gave up my job as a graphic artist to pursue art that I discovered woodcut printmaking, and through the use of the chisels and mallet graduated onto carving reliefs out of the printing block or plank and then on to carving three-dimensionally. My favourite timber for carving is lime wood which is a native forest tree. It's a wood that has been used for carving for centuries throughout Europe because of its qualities of creaminess and softness even though it is classified as a hardwood. It also lends itself to being painted because it is so light and has no grain as such. I like subtracting the wood from the figure within. Wood is clean, smells good, and I love the challenge of making something so low-tech, with the simplest of tools, that when finished exists in its own significant space and has meaning. Phew! First, you will need to support your art. You will need to pay for the time and space in order to make it. That will be your biggest obstacle. After that, consider it a huge privilege to be an artist. Carry that certainty and confidence in your own creativity with you so that even when the bad times come, i.e. rejections, discouragement, failure and being consigned to oblivion as most of us are, at least you will be sustained with the thought that you did or are doing what you really wanted to do. Can you tell me a little bit about your creative process? How do you get from tree to finished piece? I start off with a log, usually bought from a tree surgeon by the metre, and it's always an unwanted tree so it feels good to start with, this transformation of a chopped down tree. I do tend to think in a tender way about the tree. The log is usually a cylinder, i.e. no branches sticking out that 'look like something'. The something I want to make is in my head and it has to come out of the cylinder or be revealed. That means cutting away the wood with a mallet and chisel, for several hours a day for days on end, sometimes for months on one piece. Only occasionally will I make a clay maquette or a small sketch. I draw on the trunk with charcoal or black paint to clarify the forms. Draw and chisel, draw and chisel. if it's a figure I'm carving then I usually start off with the head because I then have a 'persona' and then the rest seems to follow. I've also got lifting gear to raise or lower logs, and a chainsaw which is handy for removing wood quickly when starting out, but most of the time you are 'drawing' and removing wood with a few favourite sharp chisels. You get into a rhythm and into the zone with carving. It's the best place to be. When I am not working I feel edgy and not quite right. I do tend to procrastinate, but once I have started carving it's best not to interrupt. The painting of the wood comes last of course and is definitely the most rewarding part of the process because the end is in sight. The whole thing is labour intensive and it does feel as if you've given life to something which then goes out into the world. A meme, not a gene. Christine's Amazonian Women will be on show throughout May for the STRONG exhibition. We are very excited to be hosting our first official exhibition since we moved location late last year. We hope that you will be able to join us between 1st-28th May for STRONG, an exhibition featuring local and international artists Ian Hodgson, Gill del Mace and Christine Kowal Post. Gill del Mace is an Australian artist who needs little introduction. Well known for her depictions of circus performers in the style of Magic Realism, Gill has produced an exciting new body of work portraying STRONG females and males. Of course, the much sought after Knife Thrower will be part of it! An AP nonetheless! Ian Hodgson has become one of Brighton's best-known artists. Well known for his stunning Angel and figurative pieces, Ian has now added a large body of abstract work to his repertoire, the roots of which stem from his hugely popular Murmuration series. We are thrilled to have his new collection of work for the STRONG exhibition. 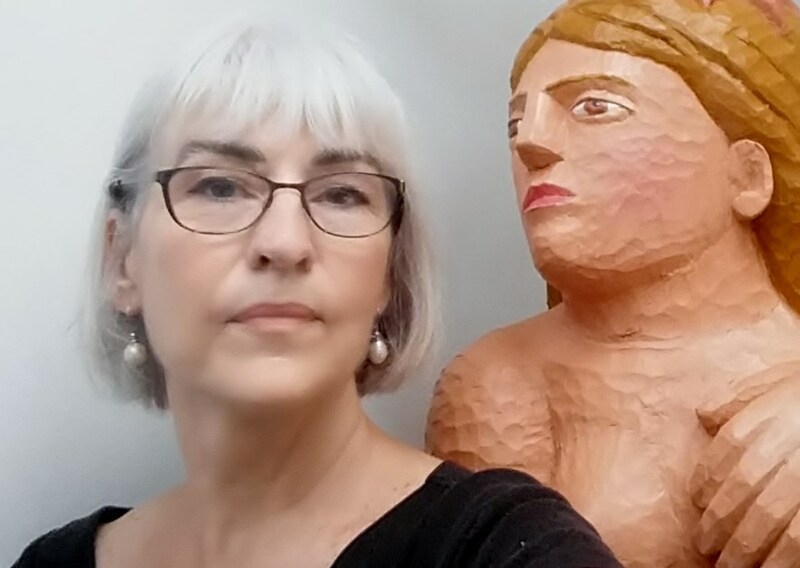 Christine Kowal Post is an internationally renowned 3D artist who challenges patriarchal attitudes and expectations of women through her wood carvings. Her powerful and STRONG women are confident and fearless without abandonment of their femininity. We are pleased to have Christine's work for this exhibition - work which has never before been exhibited in the UK!